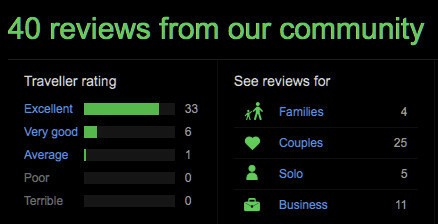 We're number 1 (of 15) of Bed and Breakfasts in Melksham, according to Trip Advisor. 100% of guests say they would return, and our overall rating score is 96% - that compares to 92% who would return and overall 95.7% rating for the establishemnt at No. 2, and 41% returning / 61% overall rating at the bottom of the list - to be fair to that establishment's current management, recent reviews are nuch better and they're now light years ahead of where they used to be. It's not exactly that we want to be best - just that we want to be the hotel / B&B that everyone enjoys and wants to return to. Not only does it make us feel good if we're getting high marks, but it mean our customers are feeling good too - and they become our ambassadors. Calculations - overall rating. I've scored "excellent" as 100%, "very good" at 80%, "average" at 60%, "poor" at 40% and "terrible" at 20%. And simply averaged out our 40 scores. Different hotels and B&Bs offer different facilities. If you're looking for a late bar and a swimming pool on site, we're not the place for you. And indeed when I get phone calls that say "we've tried Xxxx and Yyyy but they're full, do you have a room?" I'm very careful to welcome people for whom we can offer what they want, but to turn away people for whom we're not well suited. A degree of compromise here - if someone knows what we can and can't offer and concludes "not exactly what I was looking for, but I'll take it" that's fair enough, and the initial honesty without overselling provides a positive start to the stay! As well as 15 B&Bs, four hotels are listed in the Melksham Area, and we can compare with them too; they range down from 87% to 76% who would return, and from 89.8% down to 81.3%. No names quoted, and a note that for some people the other places will be more suitable than Well House Manor - after all, we have just five rooms and we don't try to be all things to all people.